With this latest twist, Beijing now appears to feel the time is right to change the facts on the ground. The turbulent South China Sea (SCS) has emerged as a regional flashpoint, with sovereignty disputes over rocks and islands driving increasing tensions. Recently, a new twist to the saga has emerged, in the form of new artificial islands being created by China in an effort to bolster its sovereign claims. While the other claimants in the region – Vietnam, the Philippines, Taiwan and Malaysia – are all in control of natural islands, China is the first to control the artificial variety. At the same time, Beijing is also trying to enlarge the existing islands that it already has under its control. These news islands and enlargements are essentially new, and have the potential to intensify the disputes and the associated level of acrimony. 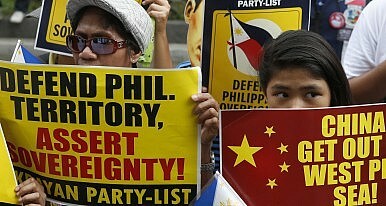 One of the most noticeable changes that have occurred has been in the Spratly Islands. Until the beginning of 2014, the Chinese presence in these islands consisted of a handful of outposts that comprised a collection of concrete block-type houses perched atop coral atolls. Now, China is expanding most of these islands, rocks, and submerged reefs through landfill with sand dug from nearby reefs, which is being dumped to create new structures. After the landfill is completed, the existing minimal infrastructure is considerably upgraded. In some cases, the newer islands are being created from submerged reefs and shoals. Presently, activity is underway on five different reefs. One of the primary areas of land reclamation and focus has been the Johnson South Reef. Historically this was the site of the deadly skirmish that was fought between China and Vietnam in 1988, leading to the loss of more than 70 Vietnamese lives, along with the sinking of two Vietnamese boats. Afterwards, China took possession of six features in the Spratly Islands. Fortunately, despite the considerable aggression in Chinese posturing in more recent years, there has as yet been no replay of those bloody events. Still, the current attempt to build artificial islands has caused considerable anxiety amongst other claimants. The primary concern stems from the fact that China is preparing to build an entire air base along with a concrete runway meant for fighter jets on the Johnson South Reef, mainly to assert its claim over the Spratly Islands. Civilian ships are planned to be modified to become large, low-cost floating production platforms in the South China Sea. Other vessels will be used to deliver water, as there are no sources of groundwater in the area. The details of the construction plan were confirmed when the China State Shipbuilding Corporation (CSSC) proudly published the details of the proposed runway and air base on its website. In exploring the rationale for China’s aggressive claims to nearly 80 percent of the South China Sea through its nine-dash line, the most commonly suggested view is its growing energy dependency. This argument gets support from numerous energy forecasts, including the 2013 IEA World Energy Outlook, which revealed that Chinese demand will account for 31 percent of global net energy demand growth between 2011 and 2035. China’s energy demand in 2035 will be double that of the United States and triple that of the European Union. This enormous appetite for energy resources, backed by growing naval power, will have considerable implications for the energy-rich SCS. While estimates vary, according to reliable reports the South China Sea has proven oil reserves of 7.7 billion barrels and natural gas reserves (proved and probable) of 190 trillion cubic feet, making it in effect an immense reservoir of energy and a prime driver of regional geopolitics. A recent study by the U.S. Energy Information Administration suggests that virtually none of the proved and probably oil and gas reserves in the South China Sea lie anywhere near the Spratly Islands. It does go on to say that the area “may contain significant deposits of undiscovered hydrocarbons.” Still, it is apparent that the Chinese struggle to gain control over this vast area is not just about energy resources, but also about gaining strategic space in the region. With its keen sense of history, China appears to be following its own interpretation of the 1823 Monroe Doctrine, attempting to template it in the East/South China seas. Everything inside the so-called “first island chain,” which stretches north in a curving line from the coast of Borneo, past Taiwan to southern Japan, is – in Beijing’s considered opinion – its strategic backyard. Hence, the aspiration to dominate this entire area while denying access to the only other naval power in the world (the U.S.) that can prevent it from doing so. At the operational level this ambition is probably the guiding light behind the Anti-Access/Area Denial (A2/AD) strategy that is followed by the PLA. In 2012, the Chinese Communist Party reclassified the South China Sea as a “core national interest,” placing it alongside such sensitive issues as Taiwan and Tibet, enhancing the strategic value of the issue among its local population. Meanwhile, China has moved past the “biding time” phase in its foreign policy and has started adopting aggressive posturing on issues related to the East/South China seas. The age-old Chinese dictum of hiding one’s capabilities and strategically biding time for an opportune moment, which found a revival in Deng’s “24-Character Strategy” on foreign and security policy has finally been set aside, with Xi Jinping preferring a much more aggressive approach. The new leadership under Xi has been keen to establish its domestic authority, and in foreign policy this has expressed itself in a much harder line. It is apparent that Beijing now feels the time is right to assert its sovereign claims, with aggressive posturing if necessary and by creating new facts on the ground, including a string of island bases and an unsinkable aircraft carrier in the form of an air base right in the middle of the South China Sea. What is not apparent is whether such moves will reinforce its claims in the eyes of international law.